A full range of Ultrasound gel, Ultrasound Transducer Probe covers and Thermal printing Paper. Beehive Solutions own brand Ultrasound Gel is one of our most popular products, with sales to NHS and Private Ultrasound facilities across the UK and beyond. Also, don't miss our selection of latex and latex-free Ultrasound probe covers and the cheapest Thermal imaging film on the market. 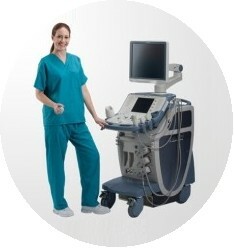 Do you run your own Ultrasound Clinic ? Have you considered out-sourcing your Ultrasound lists? Rather than buying and maintaining your own equipment, Beehive Healthcare Solutions has a range of Ultrasound Managed Service options to suit your individual requirements. Discuss your needs with us now. you'll need to "Create An Account" and then "Log-In", to access our NHS and Healthcare Staff prices.